Corby and Migration: Corby & Migration Exhibition is nearly here! If you've walked through Corby town centre this month, you may have noticed the giant Greenfinches staring down at you from the advertising boards... This means the Corby & Migration exhibition is getting closer! From next Wednesday the 18th of October, at the Rooftop Arts Centre in Corby, you will be able to see all ten of the paintings I have completed for this project. It has been a challenge - the last brushstroke went down onto canvas earlier this month - but I have really enjoyed putting these paintings together and getting involved in something a little different. As well as the ten paintings, the exhibition will feature work by interdisciplinary sonic and visual artist Warren Shaw. 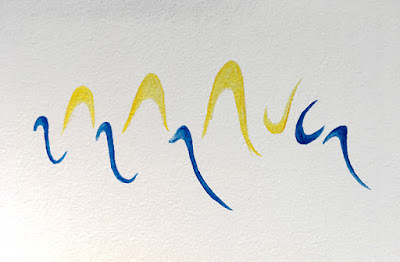 Warren has been listening closely to the songs of the ten birds I have painted, and is creating a visual response to these. One of the statements that has arisen several times throughout our group discussions of the project has been "what if the woods were silent?" A powerful and sobering thought... We are so used to the songs of birds, we take them for granted; but we would soon become aware of the absence of their chatter if their habitats were to continue disappearing from our urban spaces. The exhibition will run from 18th-28th Oct, and the Rooftop opening times are Wednesdays to Saturdays, 11am-4pm. On the Sunday 22nd 11am-4pm, the exhibition will be having an Open Day at the Rooftop, and you are invited to come along and participate in our Workshop! You can help us create a large collaborative art piece in response to the birdsongs. There will also be the opportunity to add to the exhibition by creating your own visual response, which can be added to the walls. In addition to this, there will be a "Treasure Hunt" in Thoroughsale Woods (by the Boating Lake). Pick up a question sheet either from the Rooftop or the Boating Lake, and find the bird artworks in the woods to answer ten questions. Filled in sheets with all ten correct answers can be brought back to the Rooftop before 4pm for the chance to win from a selection of lovely little prizes. Refreshments will be available at the Rooftop from 2pm. We hope you can join us! 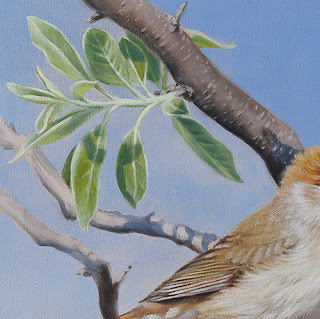 I will leave you with a sneak peek of one of those last two paintings - see if you can guess the bird?